A climber pauses to enjoy the view of Mount Foraker from the west summit ridge of Denali (Mt. McKinley). 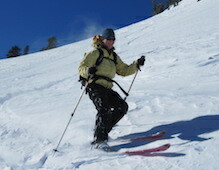 Our 21-day expeditions have the best safety record of any guide service working on the mountain. 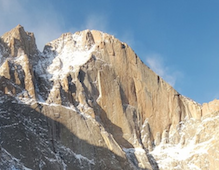 Join AAI for a summit climb on 14,000-foot Longs, whether by a technical rock route like the Diamond or a classic scramble like the Keyhole Route. 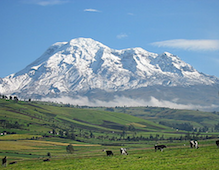 Climb Ecuador's volcanoes – including Chimborazo, highest peak in Ecuador – gain skills, and tour haciendas on this 15-day expedition. 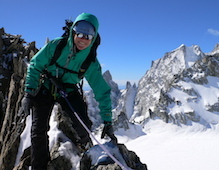 Join one of AAI's female mountain guides for an all-women clinic or climb, or set up a private trip for your group. If lack of backpacking skills is keeping you from enjoying the mountains fully, join us in 2018 for a weekend intro course. 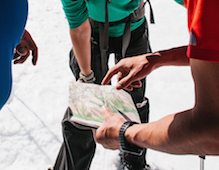 Learn to apply rock climbing skills in the alpine zone with 6 or 12 days of technical instruction. For beginners and would-be leaders alike. 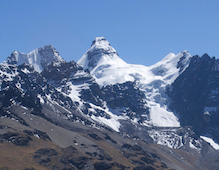 Trek into the heart of Bolivia's stunning Cordillera Real, beef up your skills, and summit 18,530-foot Condoriri and 19,996-foot Huayna Potosi. Eldorado Canyon, the Flatirons, the Front Range – Boulder, Colorado might be the best all-around rock climbing destination in the United States. Spring's arrival means that the snowpack starts to stabilize, powder snow turns to corn, and we can hit rad backcountry lines with growing confidence. 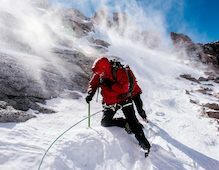 Gain alpine climbing skills and summit 14,505-foot Mt. 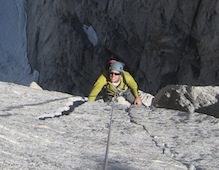 Whitney via the classic Mountaineers' Route, East Buttress, or East Ridge – in winter or summer.